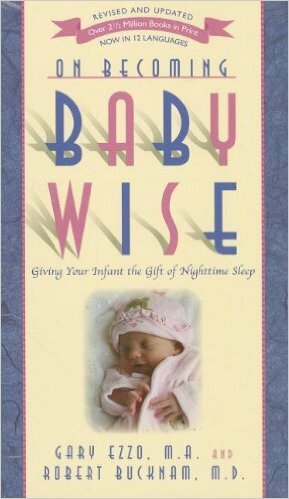 As a brand-new mom over eight years ago, the most helpful book I read was On Becoming Baby Wise: Giving Your Infant the Gift of Nighttime Sleep by Gary Ezzo and Robert Bucknam, M.D. This was the book I turned to over and over again for practical advice on helping my infant sleep, eat and play well. I’ll say upfront that I understand that not everyone is a “schedule” type person. I know Moms who have great success at just going with the flow, especially as the number of children you have increases. However, I do happen to function at my best when I have at least a skeleton of a plan. Being a first-time parent, it gave me a sense of security to know what to plan for and expect at different times of the day. Therefore, I recommend to others to at least try a schedule, even if it’s just a basic one that includes having meals, naps and bedtime around the same time each day. On Becoming Babywise then moves on to discuss feeding philosophies, concluding the section by recommending parent-directed feeding, in which “baby’s life is guided by a flexible routine.” This leads into the following chapter on babies and sleep. The only way I can judge the recommendations from this chapter is on how they worked for me. Both of my girls were excellent sleepers, sleeping at least six hours straight at night by the time they were between six and eight weeks old. Let me just say that I am one who needs my sleep and what a blessing it was to have them sleeping through the night very early. This chapter also mentions sleep props, one of which could be rocking your baby to sleep. I loved rocking my babies and would occasionally rock them to sleep, but most often rocked them until they were only very drowsy, then put them in their crib to actually fall asleep. The book proceeds to talk about facts on feeding, another chapter that I found very helpful. I did nurse our girls, but was not one of those moms who love every minute of it and rave about what a wonderful experience it is! I nursed them because I was physically able to, personally felt it to be the healthiest option and, on the practical side, it was the most frugal choice. I understand that not everyone decides to do it that way and certainly respect each mom’s decision. Chapters six and seven address what your baby’s routine might look like and includes suggested activities for baby’s waketime. If I had errands to run, I normally did those in the mornings as that seemed to be the best time for me and was also when my babies were awake the longest and seemed to be the most content. Chapter eight talks about discerning baby’s different cries, something that it doesn’t take most moms very long to figure out. I had one daughter who, as a baby, went through a stage where she cried for a few minutes each night when I put her in her crib. It was as though she needed that time to let things out, then she went right to sleep. I highly recommend reading this book if you are expecting a child or have a new baby. You may not use or agree with everything in the book. I find there are few, if any, books that I read and follow in total. However, I can almost always find something that is applicable to my situation and use it to help me be a better parent.